Then we have games like F.E.A.R. 2: Project Origin. This is a game that has no desire to hide its roots and proudly wears the label "corridor shooter" like a badge of honour. And why shouldn't it? In this age of faux tactical realism and open-word ambition, F.E.A.R. 2 gets down to the brass tacks and does so in a single gunfight better than most other games can muster in the course of their eight-hour campaign. Our sequel begins just thirty minutes prior to the explosive climax of F.E.A.R. yet for all intents and purposes, the rest of the story plays out the same. You are now Michael Beckett, a member of yet another group of elite FEAR operatives sent in to secure Genevieve Aristade, the president of the very morally bankrupt Armacham Corporation. It's quite the volatile situation you're thrown into, having to battle Aristade's personal guard then, experiencing the cataclysmic death of the city, followed by encounters with wraiths, mutant freaks and Alma Wade herself. Alma is F.E.A.R. 's main baddie, mascot and J-horror icon, all long haired and pale skinned. Her motivations are as nebulous as the story, which never really compels or makes a lick of sense. Narrative was never the game's strong point and it's a weakness easily made up by its many other virtues. One of those virtues is style. In terms of F.E.A.R. 2's tone, there are few games that so adeptly combine Japanese horror, the X-Files, John Woo bullet time and Quake. Actually, no game does this. Few games these days also give you a meaty 10-hour campaign to play through. Your journey to find Aristade and defeat Alma will take you through corporate headquarters, ruined city streets, subway systems and one extremely creepy, abandoned school. By the time the first F.E.A.R. arrived on current-gen consoles, its graphics looked tired with its stark colour palette and repetitive use of office-themed levels. In contrast, F.E.A.R. 2 is stunning. It's also slightly more varied in setting, even though you'll be happy to have seen your last crumbled street or subway tunnel by the time you're done. The Lithtech engine was never a technical marvel compared to the likes of Unreal and Crytek, so it's all the more impressive to see Monolith Productions pull out every visual trick in the book to give their game such an eye-catching presentation. These tricks are necessary to depict the hallucinogenic sequences that frequently plague your character, but do just as well rendering fire, cascading water, bullet trails and exploding viscera. Speaking of viscera, the improved visuals also do a fantastic job of depicting the action you'll find yourself mixed up in. The gun play in F.E.A.R. 2 remains its strongest selling feature. It all comes down to feel of the guns and the satisfying feedback you get when firing them. The kick of the controller rumble, the gun animations, the reactions of your foes as they get riddled with bullets and the gut-busting sound effects all combine into a glorious symphony of destruction. And we haven't even touched on the slow motion yet. Like the Point Man before him, Michael Beckett also benefits from inhuman reflexes. With a press of a button, you can switch into reflex time, which slows down the world around you while still allowing you to aim and shoot at normal speed. Reflex time drains with use but replenishes quickly. The game's design promotes liberal use of it too, which is a good thing since it gets you out of jams and elevates the feel of combat to an insane level of interactive cinema. There are some new wrinkles to the basic formula set down by the first F.E.A.R., some of them successful, others less so. One of the best additions are the short n' sweet turret and power suit sequences. At a couple points in the game you'll take command of a mech>-like armoured suit and lay waste to the scenery with dual cannons and cluster rockets. While these segments are not really fleshed out, they don't wear out their welcome either. The sequences on a fixed turret are also fun, but the power suit shines as the best way to break up the monotony of shooting guys in hallways. When firing your guns on foot, you now have the option of pulling the left-trigger to aim down your sights a la Call of Duty. This is a great touch and an invaluable game play tweak. Another features lets you topple or flip environmental objects for cover. Unlike the sight-aiming mechanic, this one is completely useless. Not only is there no sticky cover system in F.E.A.R. 2, most of the objects you're able to interact with in this manner are barely high enough to shield your knees. And if you're ducking more than shooting, you're most certainly playing the game wrong. As in the original, success in F.E.A.R. 2 comes down to good aim and judicious use of slow motion. Formerly feared as gaming's smartest AI adversaries, the replicant soldiers seem to have lost a few brain cells over time. Rushing in when they should be flanking, and fleeing when they should be pressing the attack, the AI never quite seems to click into a competitive groove, only offering up a challenge in later stages if only by their overwhelming numbers. Which brings us to the game's puzzling laundry list of flaws. As already suggested, the game is remarkably easy on the Normal difficulty level. It may be a minor issue for some, but when your game hinges on the building of tension and creepy atmosphere, all those supporting efforts are dispelled when foes fall so easily and health, armour and ammo pick ups are so plentiful. Level design, despite the injection of some pretty outdoor environments, also feels unnecessarily old-fashioned. While F.E.A.R. 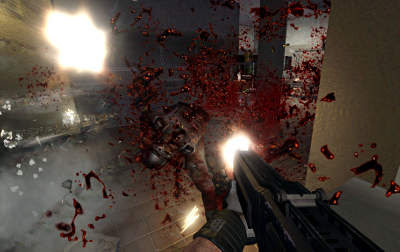 2 embraces the corridor shooter ethos like no other, it does so far too literally and ultimately to its own detriment. The outdoor streets and elementary school levels hold much potential for more open exploration, but the use of impassable rubble and locked doors reinforces F.E.A.R. 's corridor shooter roots and any potential there is left untapped. This strict linear progression is offset, of course, by some of the best scripting in the business. Monolith's scripting prowess is probably second only to Valve's and this talent goes hand in hand with their incredible flair for visual tricks and scares. F.E.A.R. 2 is not a scary game by any measure, but it can be very unsettling. Even as you fall into that predictable rhythm of hectic battles and spooky quiet moments, the designers still find a way to play with your senses and misdirect your eyes when you least expect it. I only wish that when my eyes are being distracted, it is not towards picking up yet another text log to read. This is an antiquated story-telling device that needs to be put to out to pasture because it breaks the pacing and not all the logs are that interesting to read. An argument can be made to just skip them, but some people, like myself, are story junkies. However flimsy the narrative may be, I need to get the story in my shooters. Dead Space and BioShock have both proven how effective audio logs can be, so I don't understand why (besides cost) this wasn't used in F.E.A.R. 2. Many of the above flaws are easily forgiven in light of how solid and self-assured the core game is. Unfortunately, Monolith has decided to include multiplayer and similar to its implementation in last year's Condemned 2: Bloodshot, it falls well short of the mark. For a variety of reasons, the great feel of combat from the single-player campaign is all but lost in multiplayer matches. The deficiency goes far beyond the lack of slow-motion. The weapon balance is shoddy and there are a paltry six maps included for play across some very standard game modes. Even the exaggerated head bob, which gave you a sense of place and weight in single-player, does nothing but annoy you once you're competing online, where a sense of responsiveness wins out over immersion any day. By far the most interesting mode is Armored Front, which sees two teams vying over control points with the aide of a powerful mech suit per side. This is fun for a while but suffers from serious balance issues of its own. As expected, the suits are overpowered and victory hinges on which team has the best mech jockeys. F.E.A.R. 2 is actually an outstanding first-person shooter that should not be overlooked on the Xbox 360 or the PS3. All the more shameful that a slew of puzzling design decisions need to drag down its appeal. The single-player campaign concludes with a whimper, not a bang, as well as the obligatory tease at another sequel. Here's hoping that Monolith uses that next opportunity to give their narrative a much-needed boost so that I actually care what happens next. I'm also hopeful that another F.E.A.R. game will finally bring with it a respectable multiplayer component in the same league as Halo or Call of Duty. In an age when those franchises exist, there's less of an excuse for other developers to skimp on either their single or multiplayer experiences. It's truly what separates the good games from the real triple-A titles. Monolith has shown that they can deliver, so why keep labouring within the confines of small ambitions?